Although situations and atmospheres are omnipresent in organizations and have a significant influence on the behaviour of the members of the organization, they are only seldom regarded as relevant research subjects in management and organization research and systematically investigated. 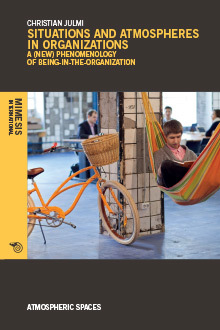 This book enters unknown territory in that it elevates situations and atmospheres to the most fundamental and everyday features of being-in-the-organization and investigates their development dynamics systematically. The new phenomenology of the German philosopher Hermann Schmitz, and critical supplements from his follower, Guido Rappe, serve as the theoretical foundation of the reflections. Human corporeality and subjectivity are at the centre of the reflections. Christian Julmi was awarded a doctorate in business economics at the Faculty of Business Administration and Economics, University of Hagen (Germany). In his dissertation, he discussed the development dynamics and method of appearance of atmospheres in organizations thematically. He is an Associate Member of the international research network “Atmospheric Spaces”. In 2007, he was awarded a master’s degree in industrial engineering from the Karlsruhe Institute of Technology (KIT). His research focuses on the area of management and organization theory. “There is a lack of a fundamental theoretical understanding of what situations and atmospheres in organizations are, how they are created and influence each other mutually, and how they can be described adequately. Against this background, the goal of this study consists of working out the creation and development dynamics of situations and atmospheres in organizations based on a phenomenological approach. The book is aimed essentially at applying the phenomenological foundations to the organizational context. In the foreground is the question of how social situations and shared atmospheres develop in organizations. Corporeal communication, which is similar but not identical to nonverbal communication, is worked out as the starting point of a development of this kind. Following a discussion of how social situations and atmospheres emerge from corporeal communication, the question is examined of how both can be established in the long term, and in this sense exist independently of individuals but still develop authority. There will be a discussion of the connection between the atmosphere of a gemeinschaft and the spatial atmosphere of the environment, which also includes the architectural design of spaces. The question will be asked whether there is anything like a social situation and shared atmospheres on the organizational level as well. It is shown that the concept of organizational culture basically represents an organizational situation, whereas the concept of organizational climate points to the atmosphere(s) of an organization. Through this link, the interconnection between the two concepts of organizational culture and climate is illuminated in a new way. This interconnection is then expressed in the so-called ‘gestalt cycle of the organizational culture’.